It seems to me that someone who reviews a film with a measured pace should be someone who appreciates those films, just as a reviewer of a Cleveland Orchestra Concert shouldn't be someone who would rather listen to the Beatles. The Emperor here is Joseph, who says that Mozart uses too many notes. 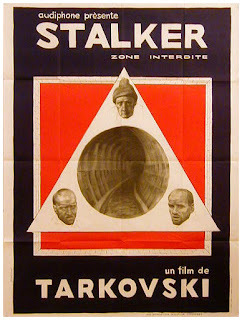 For those who have the right patience (and such films mesmerize more easily on the big screen than on the tv screen), Stalker is a worthy film. I'd see it again if I weren't going to spend the afternoon in the 4.5 Mysteries of Lisbon. Thanks for the comment, Charlie. While I certainly don't claim to speak for Charles Cassady, Jr., as editor of this blog I do want to address your points. First and foremost, I have to say that just because someone doesn't like 'Stalker' does not necessarily mean they don't appreciate films with a measured pace. Personally I quite enjoyed the 4 1/2 hour 'Mysteries of Lisbon' you mention going to see, not to mention films like 'Marborosi' and 'Ullyses Gaze' that might seem very slow paced to many viewers. And yet, like Charles, I found 'Stalker' to be a bit of a bore. None of which is to invalidate your own opinion of the movie. But at the end of the day, the only job of a film critic is to report their experience of watching a given film honestly and accurately. Hopefully they find some insight into that experience that will provide food for thought and conversation to those reading the review, as well. But one thing we will never do here at The Cleveland Movie Blog is try to make sure that our reviews match up with the general consensus of critics. Or, for that matter, that they always go against the grain. We call 'em like we see 'em, and we don't expect everyone to agree with us every time because there's just no way that can possibly happen. Yeah! Damn straight. And I'll tell you something else...The same thing goes for Christmas! Sorry, an inside reference to Mike Nesmith's affirmation rant in his best scene in the Monkee movie HEAD. Each to his own taste, and I'm sorry if I offend anyone deeply with my minimizing of STALKER. Better, perhaps, to suffer in a world in which cineastes overpraise this film than one in which they sanctify POLICE ACADEMY (though I fear we are headed down that road anyway). If there is one thing I hope we can all agree upon, it's that the Strugatsky literary source material is well worth investigating on its own; I just found "Roadside Picnic" online as a PDF and recommended to all. Well, maybe not to Michael Bay; he'll just remake it with car chases. Oh, go ahead, Mr. Bay, remake this one all you want, just this once. Nicolas Cage could star; he hasn't been in anything all week. A critic should never be aligned with the consensus to be part of the consensus. The tone of the review (Emperor with No Clothes) and the reverence for the source material, made me wonder if Charles came to the film as an sf reader who has a grudge against other kinds of approaches. I say this as both a writer and read of sf, not as a literary snob. "Stalker" may be too slow for some, and it may not be loyal to its source material, but it's also a gorgeous film that captures a reality of Soviet existence. I just wondered if the reviewer (not you) could appreciate any slow art film. The tone of the review didn't suggest that. It's a complete pan, and Charles's response suggest that those who like it are overpraising it. I find "The Great Gatsby" to be a bore; I don't argue that it's not one of the Great American novels. I have too much respect for the very fine people who admire it.